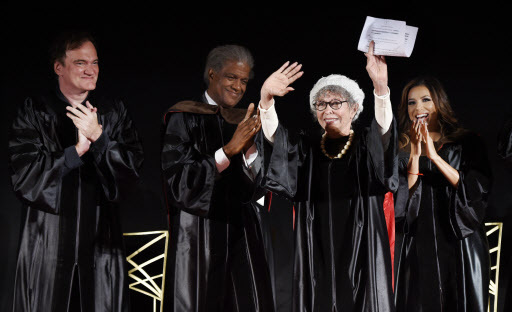 LOS ANGELES (AP) -- Eva Longoria has some advice for new graduates of the American Film Institute: Use Rita Moreno as a guiding light to use myriad points of view. Longoria presented the legendary stage and screen actress with an honorary doctorate of fine arts Wednesday in Los Angeles. Moreno took the podium with a little spin and a kick after the “America” song and dance scene from “West Side Story” played on the big screen behind her at the TCL Chinese Theatre. Moreno recalled her discouraging early days in Hollywood where she was called on by studios to play any and every ethnicity -- and how she’d use the same accent for all. She called them “dusky maiden roles,” and usually they would involve her character ending up devastated after being rebuffed by white men. And yet, Moreno said, that those directors and studios “could not succeed in drowning this Puerto Rican.” She of course would rise above that early stereotyping, winning Emmys, a Grammy, Tony and Oscar. Quentin Tarantino was also on hand to pick up an honorary doctorate, laughing about the fact that he never even graduated high school.